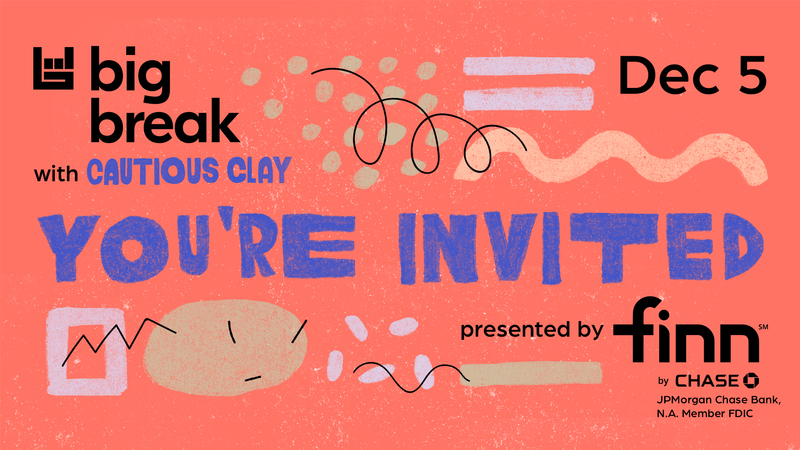 We can’t think of a better way to celebrate the end of 2018 than partying with Cautious Clay, and we know just the place. He’ll be bringing his intoxicating mix of R&B, indie-electronic, and hip-hop to NYC for the Bandsintown Big Break Showcase Presented by Finn by Chase for one night only, and you don’t want to miss it. Cautious Clay is a breath of fresh air, with his poetic lyrics and effortless charm that we can’t get enough of. Determined to make music that is meaningful and honest, the Brooklyn-resident (real name Joshua Karpehis) is guaranteed to move any audience he performs for. Need proof? Give his breakout hit, “Cold War” a spin to see what all the hype it about. RSVP here to join us for this sure-to-be-epic night filled with good vibes and stellar tunes—we'll see you there!